What does a lunar eclipse look like from the Moon? A lunar eclipse is when the Earth passes between the Sun and Moon, casting a shadow on the lunar surface. From the Earth, we see a circular bite taken out of the Moon, a dark arc slowly growing, mimicking the crescent Moon shape. But what does it look like from the Moon? Well, if you were standing there, looking around, you’d see it grow darker, the landscape around you enshrouded in shadow. That magnificent sight is the Sun being eclipsed by the Earth as seen from the Moon. Specifically, it’s taken by the Japanese probe Kaguya as it orbited our own satellite. How awesome is that? 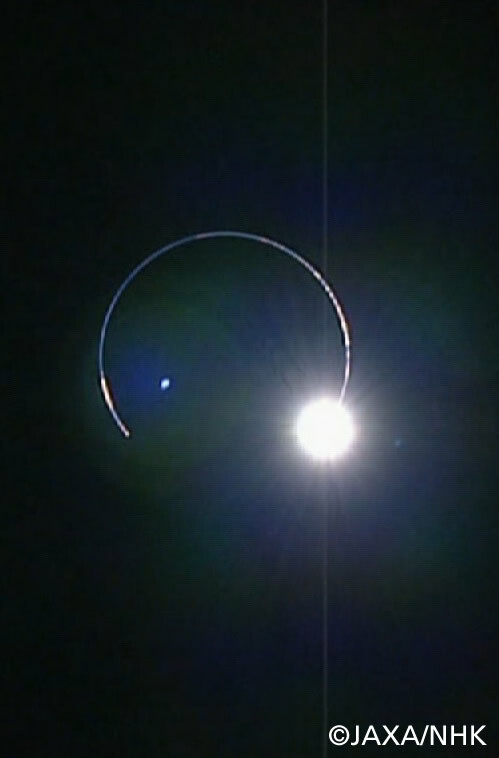 Usually, the diamond ring effect is seen in a solar eclipse, when the Moon blocks the Sun as seen from Earth. Sunlight peaks around lunar mountains and valleys, creating what looks like a wedding ring in the sky. But not this time: that’s the Earth’s atmosphere lit up, a circle of a sunlight, a ring of a thousand simultaneous sunrises and sunsets. Think about it: for tens of thousands of years, humans have watched in awe as the Moon slowly gets eaten by the Earth’s shadow. Over the generations myths have been attributed to it, legends and stories told about the Moon being eaten by dragons and other fanciful tales. Eventually we learned what it really meant (the ancient Greeks knew, those clever people)… but it’s only been in the past few years that we’ve been able to be there when it happens. And it’s now that we can turn around, look back home, and see where it all began. Sometimes you have to travel far to understand where your journey began. Tip o’ the eclipse-safe goggles to BABloggee STUARTATK. Image Credit: JAXA/NHK. Also, Emily has more.